One of the strongest aspects of the companionship between the Fourth Doctor and Leela is his desire to broaden her horizons, showing her the wonders and horrors of the universe but letting her draw her own conclusions about what she sees as long as nobody is put in harm’s way. Heightened by the innate chemistry between Tom Baker and Louise Jameson, this pairing has always been one of the most resounding in Doctor Who’s long run, and, after an enjoyable but rather pedestrian opening serial to The Fourth Doctor Adventures, ‘The Renaissance Man’ perfectly captures this relationship while spotlighting both characters amidst an incredibly strong central idea. The Doctor and Leela intend to arrive at the Monrovian Museum, renowned for its representation of medieval Earth, in order to further Leela’s education about her ancestors. Instead, they find themselves in a curious English village overseen by the mysterious collector Harcourt and his family. The Doctor quickly discovers that this is another part of the Museum where a living history of the universe is being assembled, but there’s a tremendous cost incurred to gather such knowledge. Though ‘Destination: Nerva’ began to showcas the talents of Baker and Jameson as Baker began to recapture his character’s unique intonations, both are on top form here. Baker throws himself into the story with passion as the tension and sense of dread intensifies, loudly bombastic and quick with a joke but also quietly serious and brutally angry as the true horror and villain reveal themselves. Likewise, the script makes the most of Leela, showcasing her physical prowess as well as her fierce intelligence and determination. Even if her inability to say renaissance by the end of the story seems like an odd misstep, Leela’s journey throughout this story as she realizes just how important her hunting roots are to her is extremely rewarding and adds a strong emotional layer to an already-fascinating story. Ian McNeice also gives a masterful performance as the curator of the Museum, Reginald Harcourt, a villain who feels completely justified in his actions. The Renaissance Man is the very incarnation of knowledge, the Museum possessing a book listing the names and accomplishments of everyone who has contributed meaningfully to history. As the Doctor’s ever-present internal battle of knowledge versus experience takes centre stage with Harcourt’s actions to preserve every shred of history, his fury becomes glaringly apparent, and others’ reactions to the means by which their knowledge has been taken firmly puts the Doctor in the right. With just a dash of fiction, the Doctor is able to make his presence known in a lasting and meaningful way, satisfyingly putting right this egregious wrong. ‘The Renaissance Man’ is a truly tense story brimming with colourful dialogue and clever ideas, the enthusiasm of Baker and Jameson who have firmly recaptured their iconic roles together proving infectious from beginning to end. 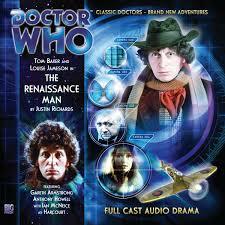 Buoyed once more by a score and incidental music that channel the original television era perfectly, ‘The Renaissance Man’ is incredibly impressive not only as an early installment in this fledgling range but also as a Doctor Who story perfectly fitting Big Finish’s 1977 teatime billing once more. More stories like this will safely ensure a long and prosperous future to Tom Baker’s time with Big Finish.